A. During the season there are many direct charter flights. If you've got time you could fly to Venice and see the sights, then get a ferry to Corfu (more like a cruise ship). If you're having difficulty finding flights just contact us and we'll try to help. Q. What Airport should I fly to? A. 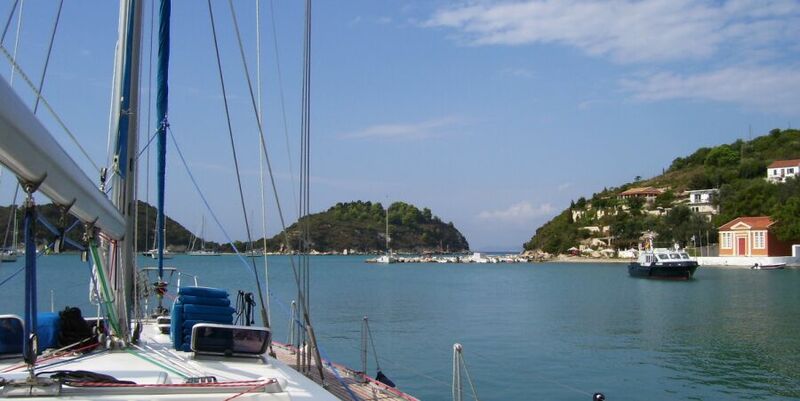 There are two main airports; Corfu in the north and Preveza for Lefkas and the southern islands. Your yacht should not be more than a 20 minute taxi ride from either airport. Kefalonia and Zante also have airports where you could pick up and drop off crew members. Q. Can I start and finish my holiday in different places? A.Yes, but normally there are extra costs. Q. Does "Leo" only operate in the Ionian? A. Normally yes, but Leo could operate anywhere in the Mediterranean, however the costs maybe prohibitive. Q. Why do we have to pay a security deposit? A. This is to cover any damages or losses incurred and will be refunded after the fuel and other costs have been paid, most people get the damage waiver insurance. Q. At what time do we get on and off the boat? A. Embarkation time is 17.00 hours (or earlier if the boat is ready). The yacht must be back in its home port by 18.00 on the last night of your charter and you must disembark by 09.00 the following day. A. Most people bring far too much, which they never use. Remember space is at a premium on a yacht so bring soft fold-up luggage. You will need towels as we don't supply them and deck shoes or soft-soled shoes to wear on board. You will need lots of light beach wear, nothing formal; a sweater and a waterproof jacket just in case; a hat, sun glasses, lots of sun factor; and a camera. Q. Are there banks or cash machines in the places we go to? A. Only the main towns have banks, some of the smaller places have cash machines and you can often get money at travel agents. Q. Do the shops and tavernas take credit cards. A. Greece has been slow to adopt credit cards some places take them but mostly not, so you'll need to have some cash with you. Q. I have been told that fresh water can be a problem on boats? A. Leo carries 1,000 litres of water which is lots but that doesn't mean you can waste it, you need to be careful. We top our tanks up whenever we can but water can be expensive in some places. Q. Will I be able to use my hair dryer? A. Yes, Leo has a 220v generator which we use in port for high power items like air conditioning. Q. How can we charge our phones and cameras? A. You can charge ashore in the bars and tavernas, or bring a car charger with you which will work on board. Q. How can I keep in touch with my office while I'm away? A. You can use your mobile phone in most places and lots of bars have internet access. Leo has a laptop on board for weather reports and emails. Q. Do we follow a set route? A. No, we try to tailor each trip to meet your requirements as long as the boat's safety is not compromised. Q. My wife wants to do absolutely nothing on the boat, it was the only way I could get her to agree to a sailing holiday? A. We can arrange to have a stewardess/crew member on board so you can both relax and enjoy your holiday. Q. We would like to meet up with our friends who are on holiday at the same time? A. No problem but we can't just stop anywhere. The boat must be safe and the number of people on board must not exceed 12. Q. My husband is a keen sailor but he doesn't have experience with large yachts? A. You are encouraged to get involved with the boat to whatever degree you feel confident. Q. My husband likes to race boats. Will he be able to race Leo? A. No. Leo is a cruising yacht, built for comfort, however given the right conditions Leo will give most boats a run for their money. Q. We would like to learn how to sail? A. Nothing gives me more pleasure than teaching people to sail. As most people want to be involved in sailing "Leo" it's hard for them not to learn. But this is primarily a sailing holiday from which we hope you'll go on to do a sailing course and get some sailing qualifications, so you can come back and skipper your own yacht. Q. As a ship's captain have you ever been asked to perform a marriage ceremony? A. No, but I have presided over a number of divorces.